"Delicious, filling, and comforting on a cold morning. It's really flexible, so substitute in your favorite nuts and fruit. Cashews and cherries are just my personal favorite." Bring quinoa, water, milk, cinnamon, and vanilla extract to a boil in a saucepan. Reduce heat to medium-low, cover, and simmer until quinoa is tender and has absorbed the water, 10 to 15 minutes. Remove saucepan from heat. 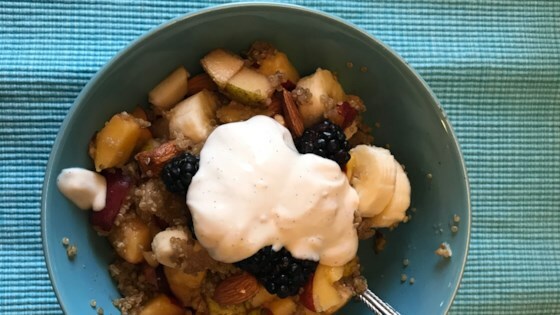 Mix cherries, cashews, and honey into the quinoa mixture; top with blackberries and creme fraiche. Loved it! I used blueberries and dried cranberries and decided to crush up the cashews before mixing them in to help them blend better. This is definitely now one of my favorite breakfasts. very good. used dried cherries, cranberries, and sliced almonds instead of cashews. Made a double batch and put in small containers for breakfast later this week.